This year, Kiefel CJ’s portrait, painted by Yvonne East, is among the 58 finalists. ‘The centenary initiative facilitated my meeting with the Honourable Chief Justice Susan Kiefel AC. The sitting was conducted in her chambers at the High Court of Australia,’ says East. ‘My hope was to capture the commanding and graceful presence of the Chief Justice (and her love of stylish shoes). Her incredible intellect is represented by the books behind her. There are 100 books: one for each of the 100 years being commemorated. Their spines are blank to represent the anonymity of the many women who have worked tirelessly to achieve their goals. This portrait represents the strength and honour of women in powerful positions, combined with femininity and order,’ says East. East was born in regional South Australia, and lived and worked there until 2014 when she moved to Sydney with her eight-year-old son to complete a Masters of Fine Art at UNSW Art and Design. This is her first time in the Archibald Prize. 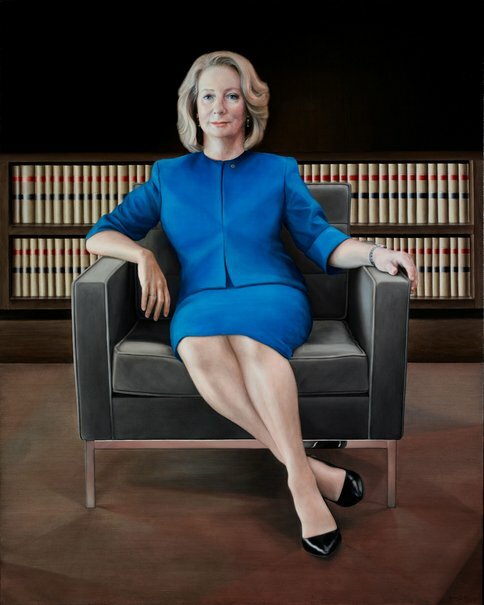 It’s a lovely portrait, painted for the anniversary of a very important moment in Australian legal history (and I do like the Chief Justice’s shoes, although I sadly can’t wear court shoes any more). Which reminds me, on the topic of portraits of Chief Justices…former Chief Justice of the Supreme Court of Canada, Beverley McLachlin, has recently published her first fiction novel. And with a delightful sense of cheekiness, apparently Chapter 2 features a reference to a portrait of McLachlin (via @cjmandell). This highlights the importance of portraits such as the above. They are a symbol of the fact that times have changed, and that a woman can not only be admitted to practice, she can reach the pinnacle of the legal hierarchy.